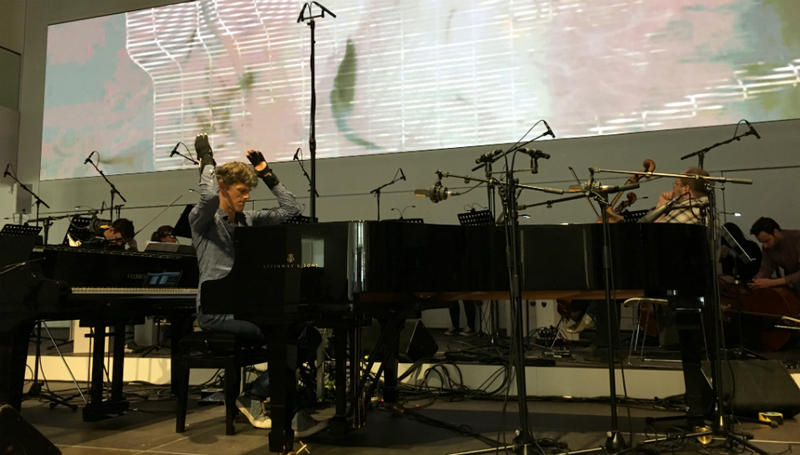 Over the last couple of years, Berlin imprint Neue Meister has hosted a series of concerts in the DRIVE: Volkswagen Group Forum that brings together composers striking a midpoint between classical music and electronics. For its eighth instalment, a bill of genre-warping artists performing alongside the Berlin Chamber Orchestra makes for its most vivid outing to date. Offering up a nuanced opener are brothers Sebastian and Daniel Selke AKA CEEYS. Having grew up in East Berlin during the final decade of the GDP, the pair perform ‘Union’ and ‘Fall’ – just two examples of how their craft is provoked by their urge to explore recollections of their youth, both before and after the fall of the regime, and to apply those lessons and influences to contemporary music. With tastefully chosen archive imagery from East Berlin projected on a panoramic screen in the background, the former piece proves a masterclass in restraint, bolstered by paced and colourful flourishes by the Berlin Chamber Orchestra. Briefly addressing tonight’s capacity crowd in English, Sebastian Selke on cello alludes to how, at least in terms of discussing it, the backdrop of place is inextricable from CEEYS’ music. "We come from the East and that’s why we speak in German,” he says. “Sorry to all the native Americans that are here.” Though the sparse marriage of piano and cello on ‘Union’ holds elegiac weight, ‘Fall’ is the highlight. A dual reference to the fall of the wall and the season, it unravels from insistent piano stabs (think LCD Soundsystem’s ‘All My Friends’ viewed through a pastoral lens) before shivering vibrato phrases guide the piece to its peaceful conclusion. Following a faithful rendition of Arvo Pärt’s tintinnabuli classic ‘Fratres’ led by violinist Gabriel Adorján (a moment only minorly marred by an audience member knocking over an empty wine glass during a near-silent passage), pianist and composer Ralf Schmid delivers an instant curveball. Having worked with the likes of Herbie Hancock and Whitney Houston in the past, Schmid's versatility runs in tandem with his search for holistic expression in the virtual age. Reflecting a musical symbiosis between man and machine, his use of data gloves (originally developed by Imogen Heap, no less) on the debut of his new piece ‘Aira & Everything In Its Right Place’ confirms this fact tenfold. Taken from his latest project, pyanook, the performance is defined by these specially-made gloves, with which Schmid controls and manipulates electronic sounds via movement. Taking the opportunity to explain the science behind the technology, Schmid is, for a short time, a conjurer of sonic processes that are all about the connections between sound and movement that persist in the listener's imagination. With Schmid shifting between prepared piano on one side, and reverb-soaked standard piano on the other, ‘Aira’ is equal parts methodical and meditative. But it’s the second piece, which draws heavily from Radiohead’s ‘Everything In Its Right Place’, that hits home with emotive force. Beginning with the Freiburg artist stood like some futurist conductor in the darkened aisle of tonight’s slick Mitte venue, it brims with a host of patterned beats and tangential tonal patterns before building to a symphonic climax in which Schmid and the Berlin Chamber Orchestra muster brilliance. In other hands, the gloves might make for a novelty at best; with Schmid, it’s a revelation that stems directly from his attempts at fusing electronic and acoustic sound design. The crowd – including a rapt Mary Anne Hobbs – respond with an ovation. London-based composer, producer, DJ, and founder of the NONCLASSICAL imprint and club night Gabriel Prokofiev makes music that both embraces and challenges western classical traditions. Tonight, he and the Berlin Chamber Orchestra perform ‘Terra Incognita’, a new composition that draws on influences ranging from Russian classical music to tango, dark electronica and far beyond. Drawing parallels to maps from the 15th and 16th century, whereby discoverers would note “terra incognita” (“unknown territory”) on areas they hadn’t yet visited, Prokofiev’s two-part piece is composed so that solos from the orchestra allude to different “conversations”. These dances of discovery, exploration and seduction (“relating to the dangers of the journeys and then the meeting of two peoples,” Prokofiev tells us) are sublime. Beneath patterned grooves and the incantation of off-kilter drums, there’s a disfigured beauty to von Oswald’s own mangled electronic notes, which, at one juncture, sound like cartoon steam trains warping out of earshot. While the first movement is impressive, the jazz-leaning second goes one further. With its melange of xylophones, glitchy textures, hand-claps, disjointed cymbals crashes and whirring fan, von Oswald and co. rethink a whole host the classical sphere with aplomb, all while weaving a challenging response to the various components and states of sound in the modern world. As the orchestra pause and let out a collective “Uhh!”, the performance feels like pure subversion. Drawing a drawn-out applause, it’s a convention-shafting masterclass from a true maverick, and an apt finale to another exhibition of contemporary classical music by Neue Meister in a city that continues to add much to the story.